Cavs Owner: LeBron Move "Cowardly Betrayal"
They say you can never go home again, and in the case of LeBron James, that may be especially true, if Cleveland fans feel even a fraction of the ill will displayed by Cavaliers majority owner Dan Gilbert. In an open letter to "King James" following his decision to defect to the Miami Heat, Gilbert blasted his former superstar for the "narcissistic, self-promotional" media campaign that culminated in an hour-long ESPN special dubbed "The Decision." Other high notes from the entertaining rant: Gilbert guaranteed Cleveland fans will be enjoying an NBA Championship before LeBron lifts the trophy and he actually transferred the supposed curse on Cleveland sports teams to James and his new teammates. 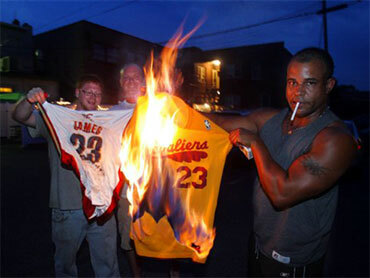 Dear Cleveland, All Of Northeast Ohio and Cleveland Cavaliers Supporters Wherever You May Be Tonight. "I PERSONALLY GUARANTEE THAT THE CLEVELAND CAVALIERS WILL WIN AN NBA CHAMPIONSHIP BEFORE THE SELF-TITLED FORMER 'KING' WINS ONE"